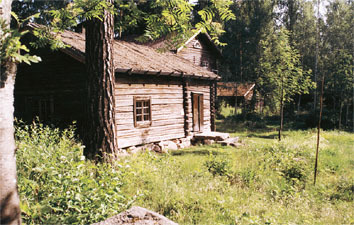 The Sätterbråten smoke house (rökstuga) was built around 1815 by descendants of Finnish immigrants. The first Finns came to this part of Sweden at the end of the 16th century. Their own building traditions were passed down through the generations. Sätterbråten was the last preserved smoke house located within the parish of Fryksände (the centre of Torsby). It was moved to the homestead museum in 1924. The big room in the smoke house was heated by a large stone furnace that would keep the room warm for several days before it was necessary to heat it up again. It was built without a chimney, so that the smoke and warmth would come out into the room through the front of the furnace. The smoke would spread under the roof like a warming cover. Food was prepared on the burning coal of the furnace, until smoke houses came to be enlarged with the so-called svenskstuga (Swedish cabin) where the cooking could be done more quickly over the fire of a fireplace. This was particularly practical in the summer, as the furnace did not need to be heated then.